‘Oumuamua may be a piece of a torn-apart comet, gravitationally launched into interstellar space, that roamed the galaxy before dropping on our doorstep.ESO / M. Kornmesser / Wikicommons. Our solar system’s first houseguest—at least, the first one we have seen in our midst—is a strange one. Scientists have taken to calling it ‘Oumuamua (pronounced “Oh-MOO-ah-MOO-ah”), after it was seen, last October, as a faint streak against a backdrop of stars, by the Pan-STARRS (Panoramic Survey Telescope and Rapid Response System) telescope, in Hawaii. How do we know it’s “from afar”? ‘Oumuamua is fast. Minus the sun’s gravitational tug, it’s clocking 16 miles per second. A massive planet like Jupiter can gravitationally kick an object hard enough to reach that speed, but get this: ‘Oumuamua entered the solar system from above the plane of the planets! There is nothing in the solar system (including Planet Nine if it exists) that can explain its speed. That is why scientists are confident that it came from beyond. 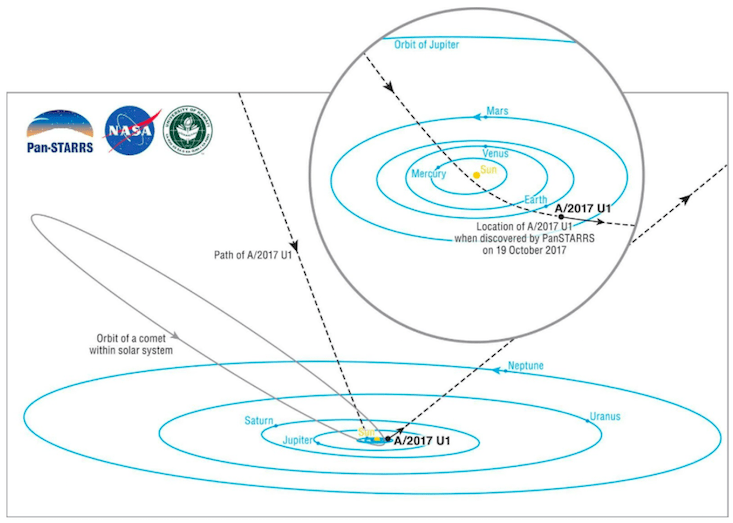 ‘Oumuamua’s trajectory through the solar system. It was only found after its closest passage to Earth.Brooks Bays / SOEST Publication Services / UH Institute for Astronomy. ‘Oumuamua also looks like nothing we’ve seen before. Its brightness in the sky oscillates by about a factor of 10 every seven hours or so, and models show that this may be due to the spinning of a cigar-shaped body (as in Fig. 2). A pair of potato-shaped bodies with different reflectivities could also account for the oscillation. The brightness pattern does not perfectly repeat, indicating that ‘Oumuamua is spinning chaotically—“tumbling” might be the right way to put it. A simulation of ‘Oumuamua’s rotation (left) and the variations in observed brightness that this produces.nagualdesign / Wikicommons. Another peculiar thing: ‘Oumuamua looks like a water-rich object, but it has no surface water. Measurements of its colors at different wavelengths show an object similar to volatile-rich bodies in the solar system—think comets and water-rich asteroids. But ‘Oumuamua passed closer than Mercury’s orbit, and showed no signs of activity: No gases escaping to form a coma, no jets, no tails. So, even though it looks like a comet, it does not behave like a comet, at least not like the flamboyant, bright comets that we know and love. So what is it? The simplest explanation is that ‘Oumuamua is a planetary leftover called a planetesimal, born in a planet-forming disk around another star but got left out of the finished product. Instead it was kicked out into interstellar space by a giant planet similar to Neptune, or maybe Jupiter. ‘Oumuamua wandered for millions to billions of years, then happened to pass close to the sun. That can explain how ‘Oumuamua came to roam outside of a planetary system—but it falls short: It doesn’t explain ‘Oumuamua’s weird shape and spin, nor why it looks like a comet with no surface water. This is where computer simulations come in. Almost a decade ago, I ran thousands of simulations of how giant planets interact with disks of planetesimals. My goal was to study how planets behave, but what I’ve found is that these same simulations can be used to understand ‘Oumuamua’s origins. Before they are kicked out into interstellar space, some planetesimals pass super close to a giant planet, so close that they should be shredded to pieces, due to gravity: The pull on the planet-facing side of the planetesimal is much larger than on the opposite side. The strong stretching force might play a role in explaining ‘Oumuamua’s unusual shape and tumbling spin, although it has not been carefully modeled yet. This is still speculation. This sort of shredding event isn’t just based on calculations, though. We have actually seen it in action. In 1992, comet Shoemaker-Levy 9 passed too close to Jupiter and was torn into a string of fragments. They fell back onto Jupiter in 1994 (some on my 17th birthday). Fragments of comet Shoemaker-Levy 9 observed with the Hubble Space telescope in 1994.NASA / ESA / H. Weaver and E. Smith (STScI). My simulations find that about 1 percent of planetesimals are torn apart by coming too close to a giant planet, like comet Shoemaker–Levy 9. Instead of bashing into the planet, most of the pieces are eventually thrown out of their planetary systems. 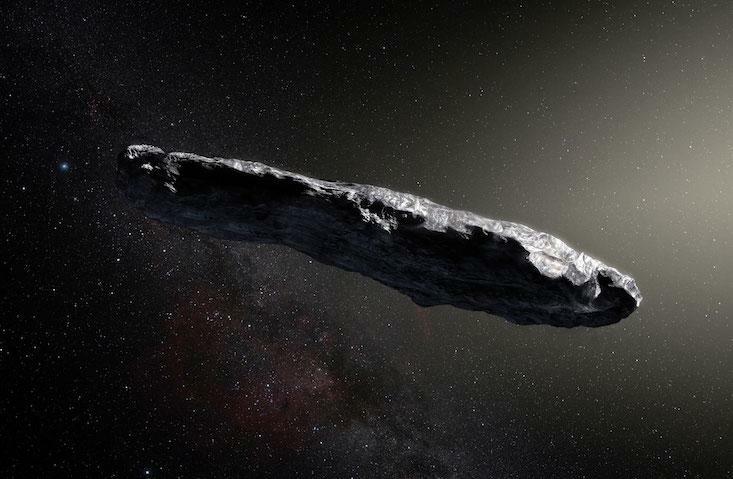 If ‘Oumuamua is a planetesimal fragment, it must have gotten shredded very violently. This still doesn’t explain ‘Oumuamua’s comet-like appearance. 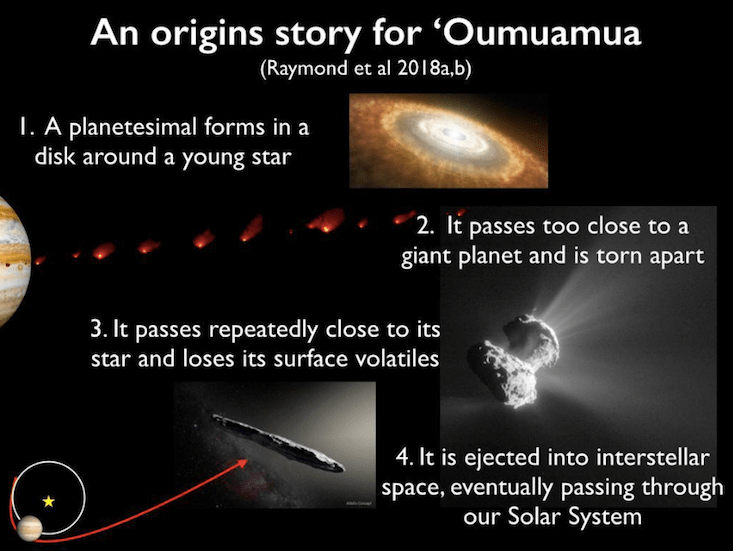 In this way, ‘Oumuamua is like another class of objects in the solar system called the Damocloids: They have comet-like orbits and surfaces but don’t give off any gases when they are heated. We think they are extinct comets that, after a certain number of trips too close to the sun, burned off all of their surface ices. Over the past few decades, researchers have figured out how quickly extinction must happen. Back to my simulations. Remember: about 1 percent of planetesimals should have been torn apart before being kicked out into interstellar space. And guess what? About two-thirds of them passed close to their stars a bunch of times before getting kicked out—enough times that they should have become extinct. So, ‘Oumuamua may be a piece of a torn-apart comet, as my colleagues and I argue in two recent papers (here [The Astrophysical Journal] and here [MNRAS]): After the disruption, ‘Oumuamua passed close enough to its star enough times to lose its surface volatiles, becoming extinct. Then it was gravitationally launched into interstellar space and roamed the galaxy before dropping on our doorstep. ‘Oumuamua’s origin story?Sean Raymond / planetplanet.net. We could test this by cracking ‘Oumuamua open. Is there ice buried deep, too deep for the sun to vaporize it? It’s zooming away so fast that tracking it down—the goal of Project Lyra—is no small feat. If that fails we can bank on the Large Synoptic Survey Telescope, which is coming online around 2021, to help us find objects similar to what ‘Oumuamua seems to be. Our story predicts that extinct comets should outnumber “normal” ones about two-to-one, and almost all of these objects should be fragments of larger bodies, meaning they might bear some trace of their violent pasts, either in terms of their shapes and spins or something else. If we end up finding a lot of extinct comet fragments, we can be confident ‘Oumuamua is one, too. Sean Raymond is an astronomer studying the formation and evolution of planetary systems. He also blogs at htp://www.planetplanet.net.